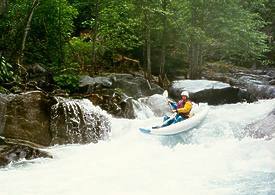 Flows: kayaks 500 - 1500, IK minimum 300, raft minimum 800? This is an awesome run in a remote corner of northwest California. 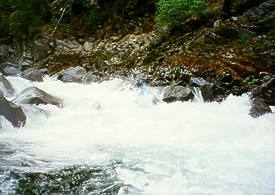 Wooley Creek is the last large tributary of the Cal Salmon before it reaches the Klamath. 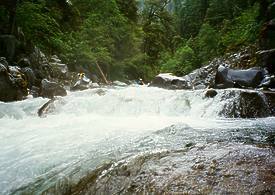 Because Wooley Creek originates entirely in the Marble Mountain Wilderness, its watershed is the epitome of pristine. 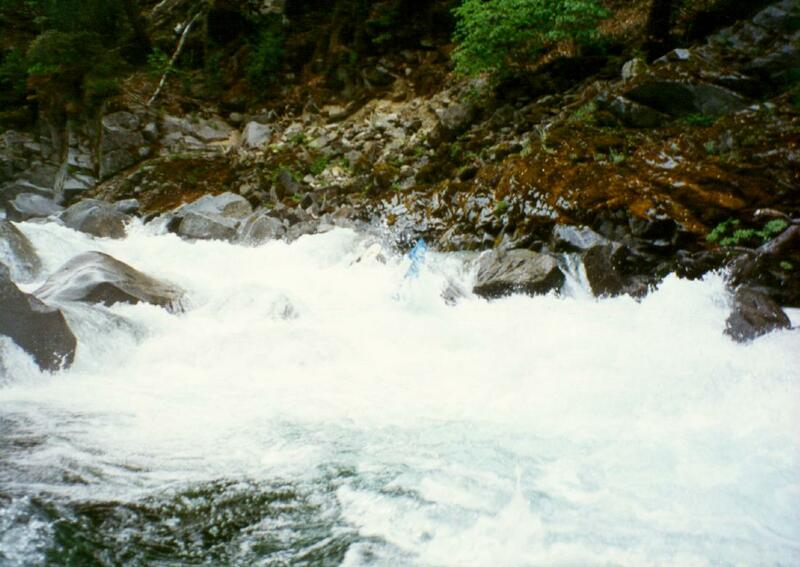 In dry years, it has been known to have more flow than the main Salmon! 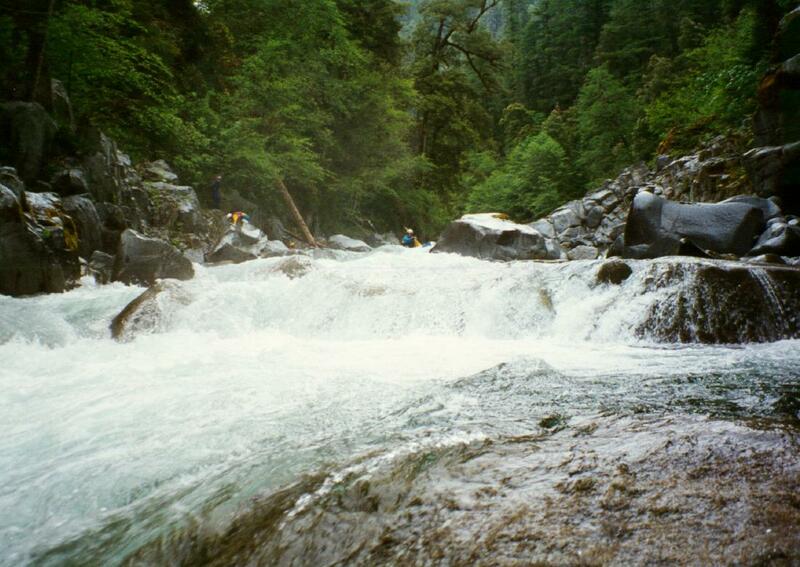 Wooley Creek is one of the only streams in California that supports a summer run of King Salmon. 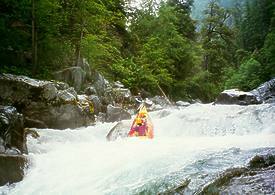 If you can pay for a horse packer, are willing to hike 12 miles to put-in, and can handle class IV-V rapids, please do not miss this run. For hardy passengers, it would make a great commercial rafting trip. Hardshell kayaks can be carried five miles to Wooley Camp, in order to run two class IV-V gorges, but I'm not sure it's worth the trouble, since you would miss the highly scenic upper canyon. In 1997, there were no mandatory portages. We got a horse packer thru Access to Adventure, 800-552-6284, same as the Marble Mountain Ranch. You'll have to carry your own paddles like rifles. When rolled up, inflatable kayaks and small rafts fit 2 per horse into the panniers. With 8 people, a 4-horse train plus riding packer would cost $70 a person; with fewer people, horses can be reduced, but cost goes up. On the hike in, one of the horses started bucking before passing under a downed tree, causing a train wreck, as three horses fell into a ravine. The packer had to unload the miscreant horse and turn it over before it could even stand up. We were surprised that the horses were OK. The hike isn't bad, although there are ticks and lots of poison oak. 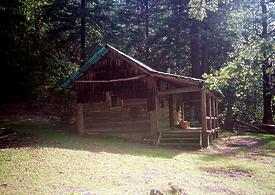 We camped at Bear Skull Flat, where Dean Monroe's pioneer commercial rafting trip stayed. This is less than a mile below the N Fork confluence. If you schedule the packer correctly, you can get the horses to carry out your camping gear. 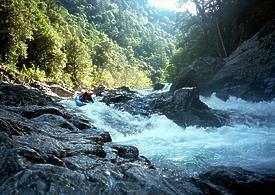 We were unable to do this, and had to carry our sleeping bags downriver (inflatable kayakers can sleep in their boats). 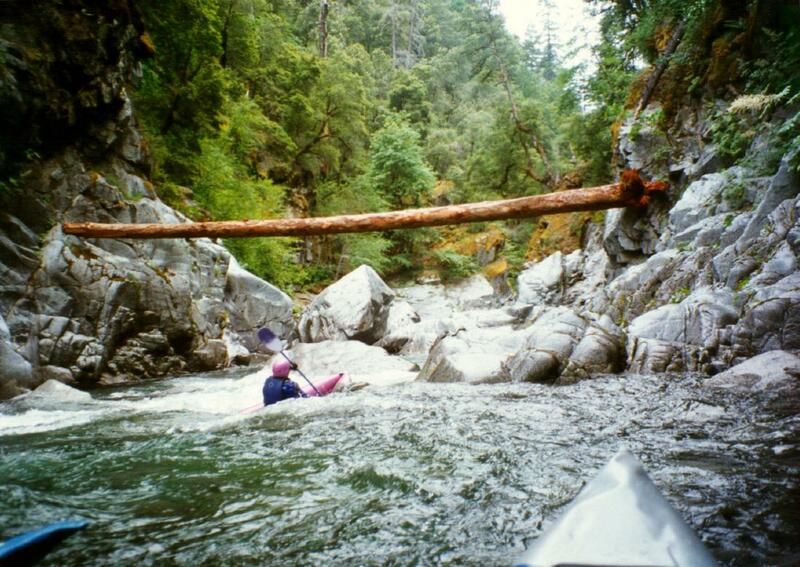 For the first 7 miles, the river is continuous class III with a few boulder bar class IV- drops. 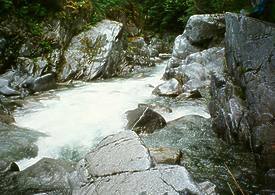 The exception is 1.5 miles below our camp, where bedrock creates a Tunnel Chute like class V on river left, and a more gradual class IV+ sneak route on the right. This is the only rapid that might be tight for rafts. After 3.5 miles you reach Fowler's Cabin (trail mile 8.5), where you could sleep under a roof in case of bad weather. If Wooley Creek is ever commercially rafted again, this would be the likely put-in. After about 7 miles you reach Wooley Camp (trail mile 5), owned by the Wooley Camp Association, to which Herbert Hoover once belonged, and where a caretaker still lives. This marks the start of the class IV-V gorges. Non-packing boaters could put in below the private property of Wooley Camp, as discussed above, and as recommended by Holbek's 3rd edition writeup. Stanley's 2nd edition description of the river is quite misleading. 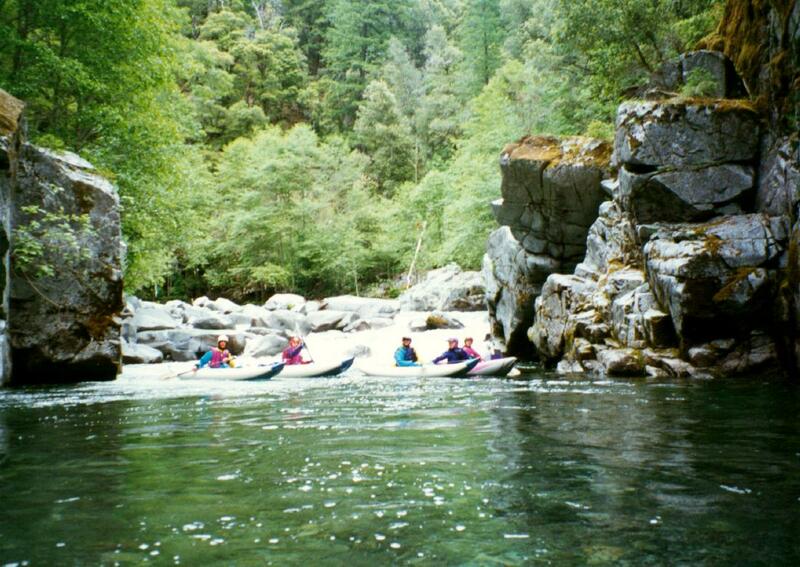 There are more than three class V rapids in these gorges. Some of them would be difficult to line or portage entirely. For example, I lined 4 times, and still had to run what I considered some V- drops. 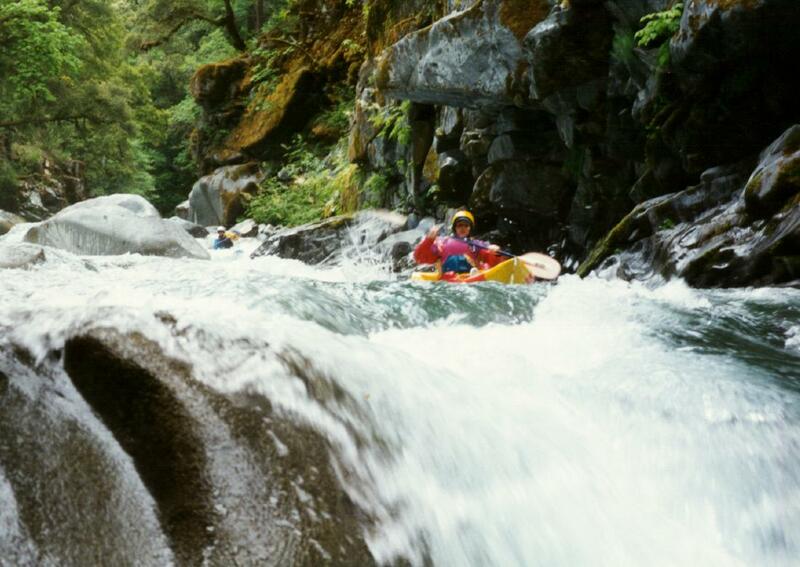 Also, many of the drops have clean routes, but unless you know the river intimately, you might miss the correct entrance by the time you stop to scout. 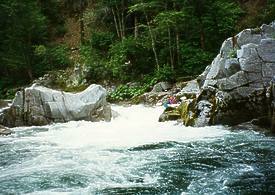 The first gorge contains mostly bedrock drops with big hydraulics. It is less threatening than the second gorge. After about two miles of the first gorge, the river eases and the trail comes close to the river at the outside of a horseshoe bend. If daylight is getting short, this might be a place to abandon your boats until the next day. From here it's less than 3 miles (up and way down) to the trailhead. 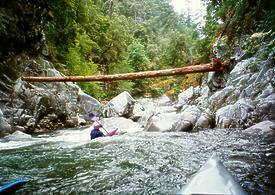 The second gorge contains many steep boulder bar drops, and some drops between steep walls that make portaging difficult. The two final class V rapids are Whoa Mule, a long class IV lead-in with big drops at the bottom (80% lineable on the left), and Fat Lady Sings, a steep class V with big hydraulics among vertical walls at the bottom (75% lineable on the right). Oops, taking the falls backwards! Several rapids above Whoa Mule, we ran into trouble owing to lapses of scouting judgement. 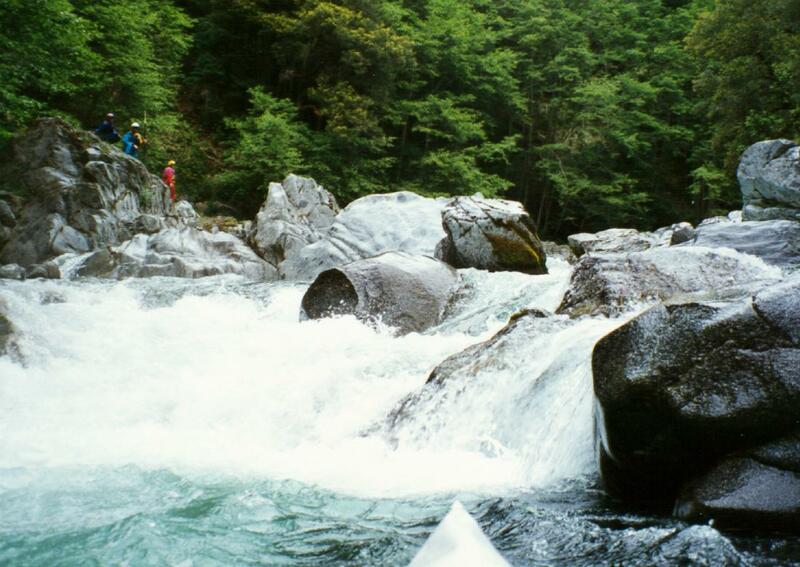 We should have portaged a single drop in a class IV+ boulder bar rapid, so as to reach an easy exit on the far right. Instead, we thought a left-to-right cut was possible. Boris made it. Bill didn't. His paddle stuck straight up in the final drop. Foolishly I followed him, and was mercilessly surfed backwards by a huge hole, where I flipped. 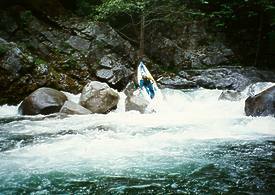 In the surf my throwbag unraveled, tying my boat around a rock near the exit of the rapid. Bill and I were temporarily stuck in a room-of-doom eddy under an undercut cliff on the right bank. We finally escaped downstream. Boris (Superman) finally pulled his boat up a cliff, lowered it down another, got in, surfed across holes at the bottom of the rapid, jumped from his boat onto my boat, and cut the rope. 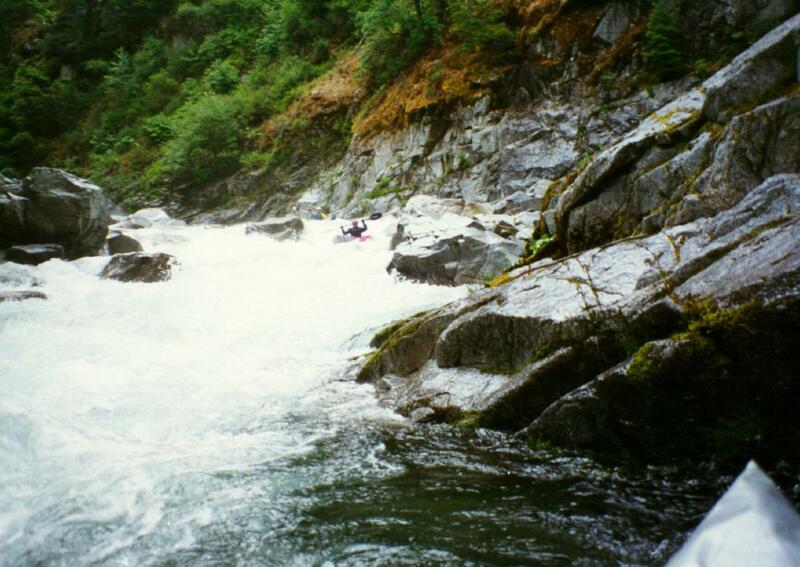 So be careful of this rapid-- it contains dangerous lost equipment. One of the countless fun drops! We all had some more swims before it was over, but emerged safe and sound with less than $200 of lost equipment. In my opinion, 400 cfs at put-in and 800 cfs at take-out (5.5' on the Salmon gauge) was too much for my tiny AIRE Lynx. Boris and Bill were better off in their Padillacs, but would have preferred less water. At 400/800 I could have rowed a 14' raft down the river, but an AIRE Puma would have been easier to pack. There is no way the last mile is 110 fpm, as Stanley says. 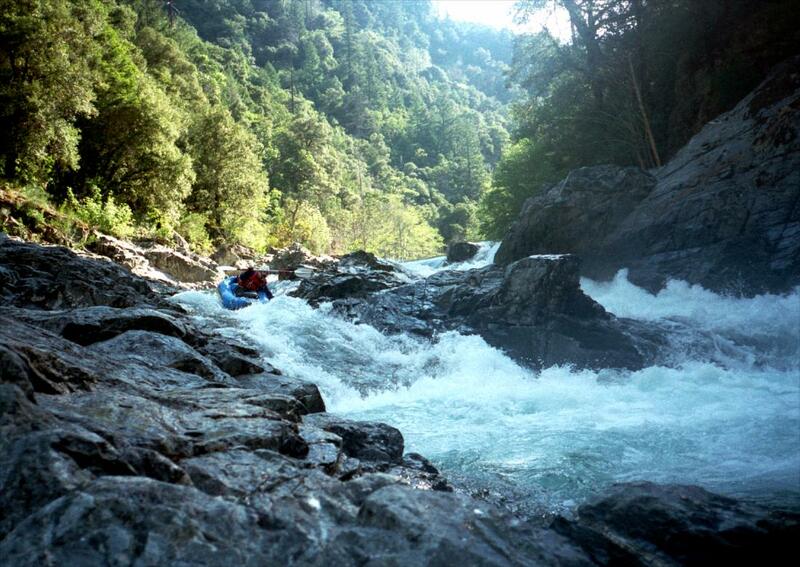 After Fat Lady, the rapids quickly become just class III, and it seems as if the whole day has been a dream. As you join the relatively turbid waters of the Salmon, fellow boaters might question where you have been.